What a wonderful evening we had on Tuesday 10th January! We officially welcomed Glynn and her husband Wayne to the Parish with a joyful and deeply symbolic service of Licensing and Installation. The service was led by the Bishop of Reading, Bishop Andrew. The sermon was preached by Archdeacon Olivia, who reminded us to look for Epiphanies everywhere. We thanked God for the faithful and loving ministry of Gill Lovell, under whose guidance so much was achieved, and now look forward to the next amazing chapter in our corporate life as Glynn’s ministry in this place begins . What does God have in store for us next? It’s sure to be exciting! 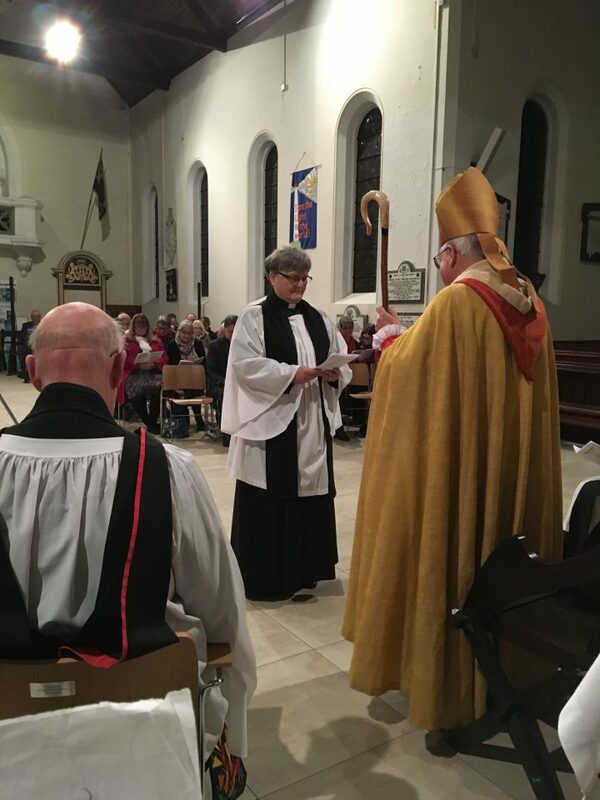 Members of church and community presented Glynn with symbols of her ministry among us, and she took her oaths and completed all the official paperwork to become Burghfield’s next priest-in-charge. Throughout the service we sang joyfully to the Lord, led so beautifully by the music group. Prayers were offered, led by Glynn, and then we all enjoyed a fantastic buffet spread in the Parish Centre.